What do you do when you’re working your way through making an alphabet book with an outer space obsessed preschooler? Well, I’m sure there are a number of things you could do, but if you’re anything like us, you find a way to incorporate that into your book and watch your child’s eyes light up when they realize that they can, in fact, make a rocket ship out of a letter in the alphabet! And yes, just in case you were wondering, yes, our uppercase letter R craft promptly went on its first space mission as soon as the glue was dry. As always, the materials for this craft are pretty straight forward. We wound up using some red, yellow, orange, blue, and black along with our sheet of white card stock to put it all together on, but let your little one pick out their own colors for their rocket ship if you decide to make one. They’ll love getting to design their very own spacecraft! To start it off, you’ll need to cut out your pieces. 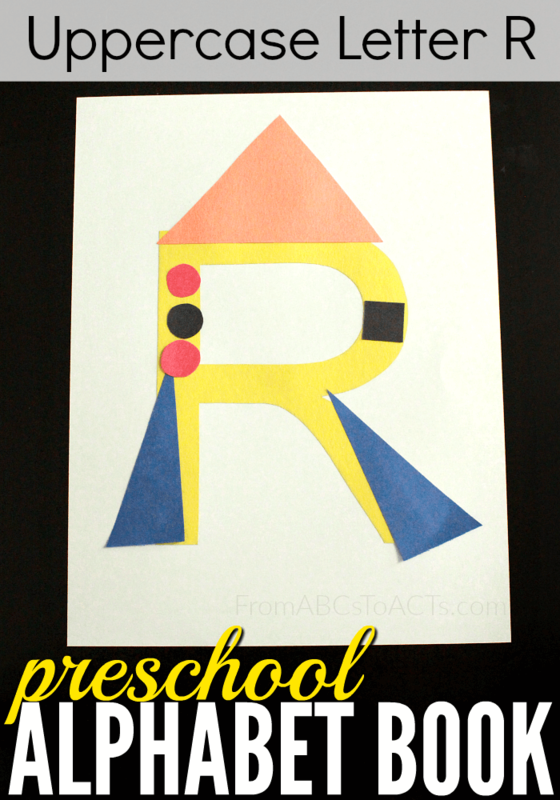 For our letter R rocket, we used the yellow construction paper as our base and cut out the uppercase letter R out of that. From there, the orange became the top section of our rocket, the blue became the bottom (we just cut out a tall triangle and then cut it directly in half), and the red and black papers became windows and buttons for the outer part of our ship. Start assembling as you normally would, by gluing your letter directly onto your card stock. And then, of course, it just wouldn’t be a rocket ship if it wasn’t pointed at the top, so glue on your larger triangle (in whatever color your child decided on). Have them add the smaller triangles to the bottom sections of your letter R.
Finish it off with some small squares, circles, whatever shapes you and your preschooler like! These could wind up being windows, buttons, or even an engine according to your preschooler, who knows?! By the time the glue dries, your little one will be ready to take their newest creation on its first exploratory mission into outer space! But while you’re waiting, don’t forget to grab the uppercase letter R page below to go along with it! They’ll fit together perfectly into your alphabet book!